Home Architects is one of the top custom home architects, luxury residential architects and one of the world’s leading log home architects (1). They have written numerous articles for log and timber frame home magazines about the subject of log home architects, timber frame home architects, architecture, design, planning and details for log and timber frame homes. They create log house designs for a variety of sizes and locations. Log home architects know how to design special conditions like this. This illustrates how Soellner protects the wood from environmental water on one of his projects. It is important to keep the end of logs above standing or flowing water. Mr. Soellner has been quoted extensively about species of wood, treatments, design arrangement, site planning, functional features and aesthetics for log and timber frame residential design. 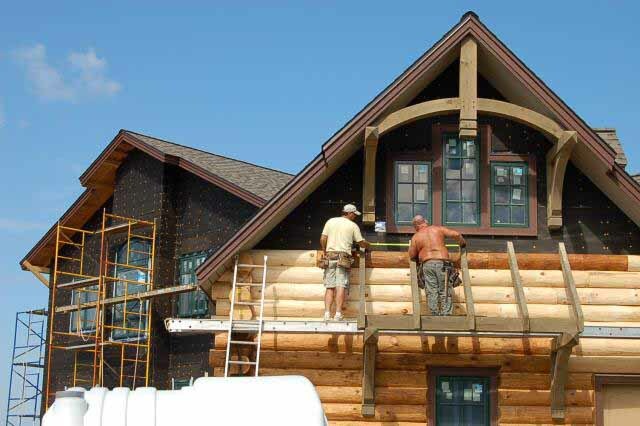 As log home architects, the Soellner firm has the necessary expertise to know what has happened historically in log and timber frame architecture and what the current trends are for this unique segment of residential design. This article discusses some aspects of these trends and ranges of costs for various systems and hybrid alternatives as well. One of Rand Soellner’s designs for a custom log house client. (C)Copyright 2006 Rand Soellner, All Rights Reserved Worldwide. “I am seeing an industry shift to hybrid log construction,” remarked Rand Soellner, “Today’s homeowners are wanting much more for their dollar these days, and the fact that log home packages and timber frame packages do add to the cost of conventional construction is one of the reasons for the attrition in the marketplace of several log fabrication companies during the last year.” When asked to elaborate on this comment, Mr. Soellner added: “Certain clients love log houses and we really enjoy designing them. We are log home architects and timber frame residential architects and custom residential designers and we love creating them. As log home architects, we have to disclose to these clients that these packages add somewhere between $35 to $55 per square foot to the cost of construction. This fact can be quite a shock to clients, who have assumed that when prefabrication companies told them that the cost would be from $35 to $55, that meant that is what their house would cost. We have seen in the SE USA that timber frame house packages can be in the $61 per square foot range +/-, depending on how and what you are using (SIPS, LVLs, etc.). Once again, this is in addition to the cost of conventional construction and likely includes some of the overhead structure as well. Unfortunately, what those fabrication companies may not have added, is that this nominal cost only covers the cost of a big pile of logs or sticks dumped in your driveway, there is considerable basic cost remaining to assemble all those logs, beams and posts on your own foundation, site costs, plumbing, electrical, heating and air-conditioning, doors, windows, fixtures, appliances, interior finishes, treatments, roofing, flashing, concrete work, on and on!” Soellner takes a breath here. 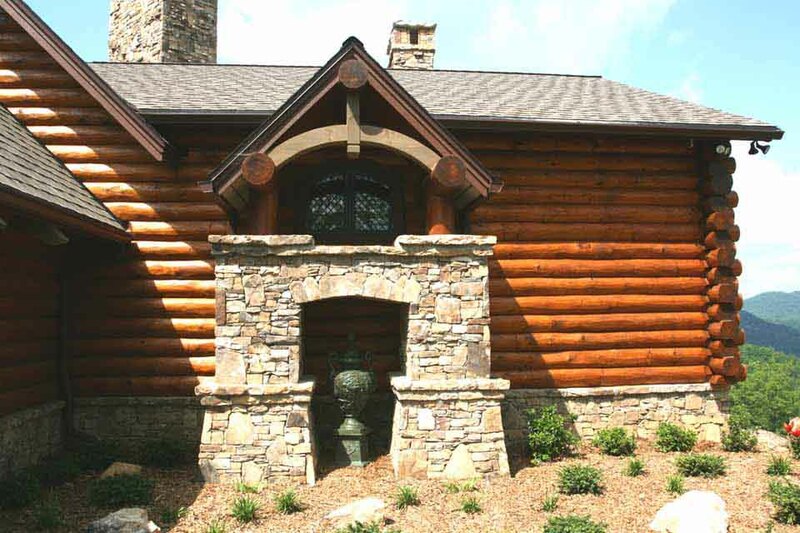 Log home architects Soellner designed this project in Tennessee. (C) Copyright 2009 Rand Soellner, All Rights Reserved Worldwide. We are starting to understand that there are many costs beyond what the log fabrication companies or timber frame house fabricators sell to you in their package. Rand Soellner continues: “So, many of our clients ask the all-important question: ‘Is there some way that you can design our house plans for our log cabin or log mansion plans to make it look like it has log and timber frame architectural features, without the cost of those genuine log house and timber frame systems?’ Great question! Real log home architects do design many hybrid post and beam houses using conventional construction systems that are nearly as cheap as tract housing, then embellish them with timber frame and other materials for pennies on the dollar. Soellner has become a master at this. Most people cannot tell the difference when they look at the finished project. The savings can be in the hundreds of thousands of dollars, even in the millions, depending on the scope of the project. Log home architects know how to accomplish this. Soellner often incorporates handsome rockwork detailing like this into his log projects. (C) Copyright 2010 Rand Soellner, All Rights Reserved Worldwide. In the end, log houses, mansions and cabins have a massive effect that appeals to many people. Their sense of permanence and stability cannot be denied. “and that’s one of the reasons I enjoy designing them, as a log home architect ,” said Rand Soellner. If you are looking for new houses, log house plans, or even a small log cabin, that is what log home architects like Rand Soellner can provide. This type of house has an appeal that is deep-rooted in the human species. Soellner thinks this could be linked to some sort of genetic memory hard-wired into people, dating back to when proto-people came down from trees and out of caves and began chopping down trees to use to build shelters. After all, that’s really what we are talking about here: trees being laid horizontally, then stacked on top of each other to make walls. Then we might design and install timber beams and trusses, which are really made out of more trees. So the appreciation humankind has for these types of houses goes way back in history. In all likelihood, perhaps 60,000 years. That’s a lot of time for this housing type to have been here. To those of us who are alive today, there have to be millions of predecessors whom have enjoyed the protection these kinds of houses have given them over the ages. If you theorize that each of our ancestors had a child from whom we came from perhaps every 25 years (as a generation span), that might be 2,400 ancestral generations and millions of people. That’s some substantial history, assuming that many of them in some way used trees that were cut or otherwise felled to build shelter. No wonder this kind of construction has deep psychological appeal. 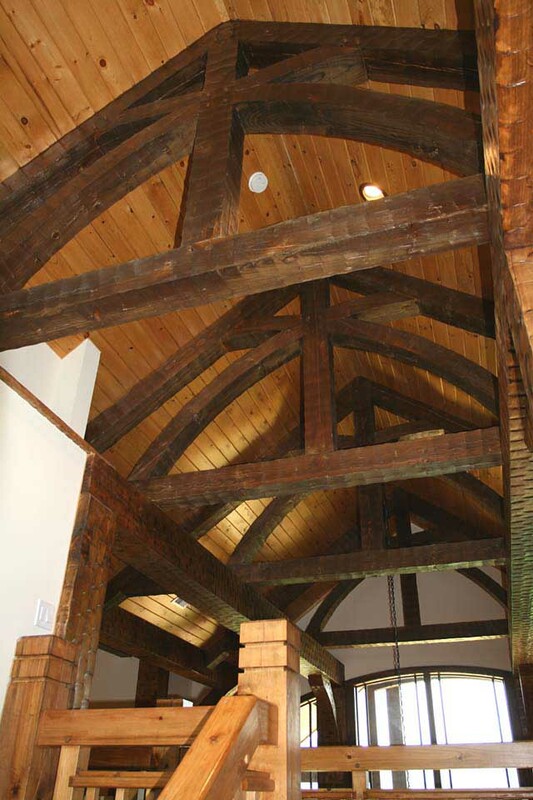 Soellner’s log houses often have muscular timber frame trusses for ceiling accents. (C) Copyright 2010 Rand Soellner, All Rights Reserved Worldwide. The Soellner firm receives e-mails and phone calls nearly every day in which the interested party asks tentatively: “We have our acreage over in Nashville (or Dubai, or Canada, or California) and I don’t suppose you’d consider designing a log house there for us, would you?” We have taken steps on this website to try to communicate that YES we certainly will! We have decided that one of the best ways is to simply list some of the beautiful places on this planet to let you know that we will design a house for you there, wherever “there” is for you. Rand Soellner Architect will prepare your log home designs, no matter where your property may be located, anywhere in the United States or on our planet. This includes Atlanta, Tuscon, Tacoma, Charlotte, Myrtle Beach, Greenville, Jacksonville, Ocala, Miami, Dubai, Canada, Denver, Jackson Hole, Park City, Cashiers, Asheville, Highlands, Etowah, Seneca, New York , Detroit, or anywhere. Log home architects design custom stacked log residences to suit your lifestyle and acreage, wherever that may be. Lake Country contacted Rand Soellner several weeks ago and expressed an interest in working together on future projects. Lake Country said they appreciated the level of detailing and quality evident in Soellner’s projects and wanted to be part of future endeavors. 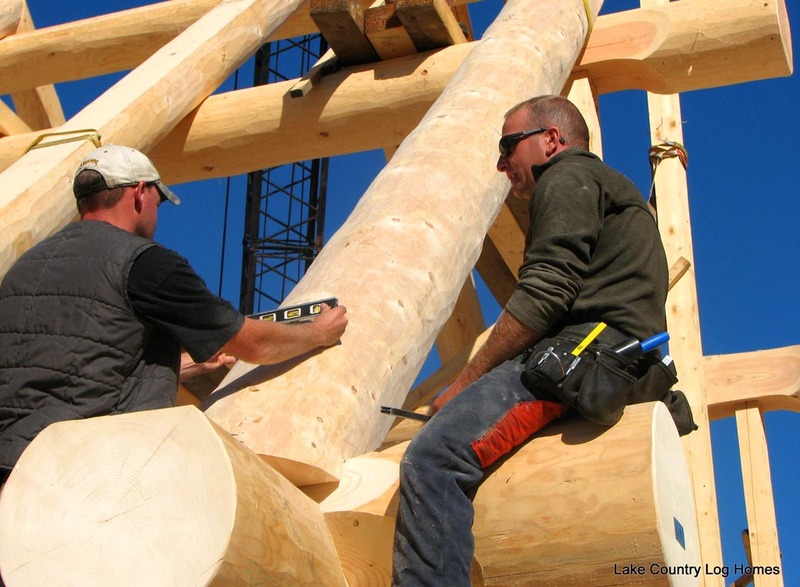 Upon reviewing Lake Country’s projects, Soellner noted that Lake Country uses sizes of logs and timbers and incorporated details that were compatible with his work. Therefore, the two companies have agreed to look for opportunities to collaborate on future efforts. Images to the left of this paragraph and below are all copyright protected by Lake Country and are used here only with their permission. 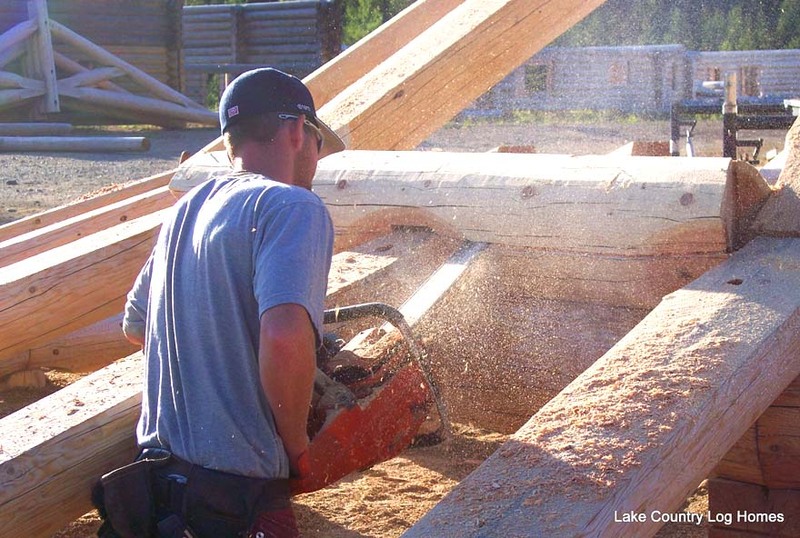 Here to the left, one of Lake Country’s sure-handed craftsmen cuts into a 16″ diameter log, custom-fitting large members together, like the mortise & tenon connection you can see just to his left. These are the kind of hand-crafted details that make a quality fabrication company stand out. 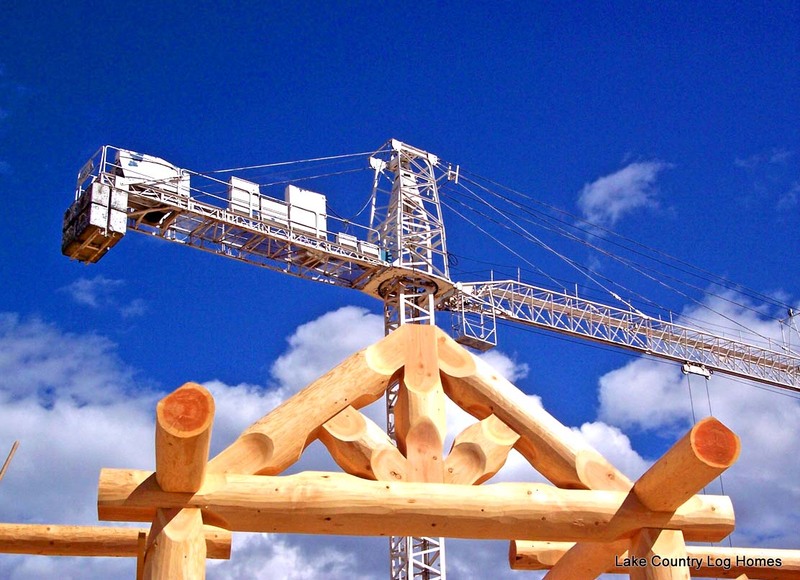 To the immediate left, you can see a large crane assembling one of Lake Country’s projects, utilizing large diameter truss members. It is this kind of capability that makes the gentlemen’s arrangement between the two companies so appealing. 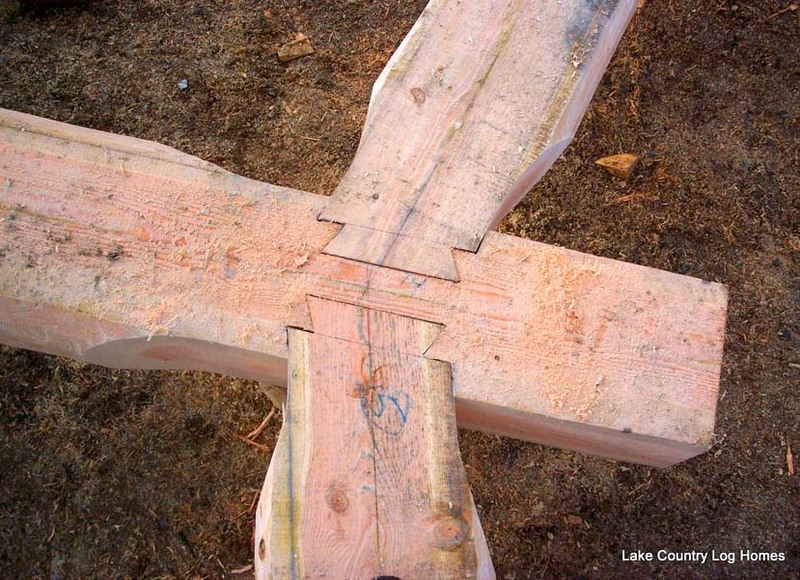 Here, you can see some of the outstanding dovetail connections in Lake Country’s joinery. 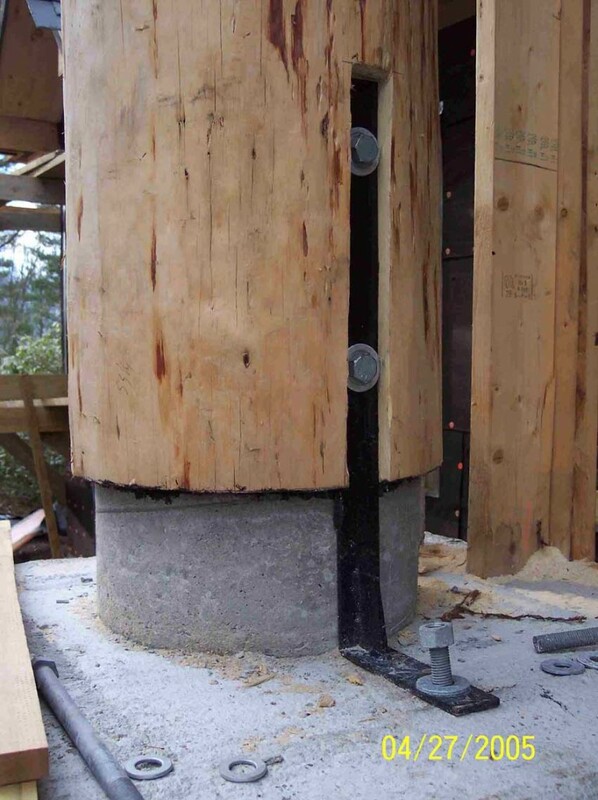 This kind of fitting is harder to accomplish, but results in projects that stay tighter together over time, as the logs lose their moisture content and settle. 1per Google rankings 2006-2009 on a typical internet search. tags: log home architects, post and beam, mansion designer, custom, cabin, luxury residential, nashville, chattanooga, whistler, destin, pensacola, timber frame, cottage, aspen, telluride, lake tahoe. We are building our network of log home fabricators to suggest to our clients in the various areas in which we design. If you are a substantial log fabrication company and would like to represent a particular geographic region, please let Rand Soellner know at: 1-828-269-9046. You may wish to represent several states or another country, based on the presence there of your facilities and satisfactorily completed projects in that region. We prefer companies that adhere to the principles of the Forest Stewardship Council and that have ISO 9000 Quality Control plans in place to insure high standards of material and fabrication quality for our mutual clients. Please have a minimum of 3 satisfied clients whom we can e-mail and phone to verify your track record in the region that you wish to represent. We will be creating a special webpage just for your company and individual webpages for the fabrication companies representing other regions, so you will receive exposure on this website for your trouble. We will request the same on your website. We will also be creating a map of the USA and possibly the world on which people can click to come to your page on our site to find you. Happy fabrication!